12-20-2010 made $810 for music education and programs. 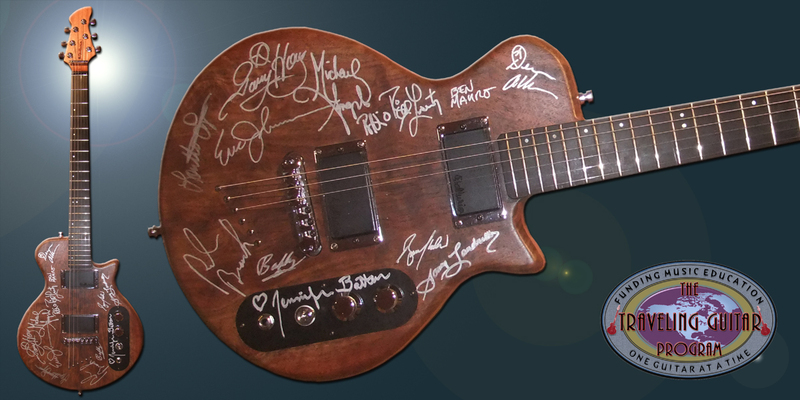 Traveling Guitar Programs' Traveler 1 Auction. December 10-20 2010 eBay Auction. 12-19-2009 and made $800 for music charities. All funds raised donated to: Make A Noise Foundation. The Lingo has a handcrafted Honduras Mahogany tone body with a single piece Honduras Mahogany neck. A clean straight forward design optimizing the overall energy transfer between neck and body. This design results in a guitar with exceptional character and sustain. The Mahogany neck and Black Walnut fingerboard create a clean tone with great note discrimination with depth and a great deal of warmth. The well-defined lower and mid-range is balanced, and the upper range is clean and well-integrated, resulting in a unique sonic package. The combination of a balanced set of Ballurio S1 Humbucking Pickups and straight-forward electronics consisting of Volume, 3-way PU Selector, and Linear Tone, creates a guitar with lots of personality.